If you ask most non-profits, charities and political campaigns what the number one priority for their online program is, the majority of them will tell you it is to raise money online. Yet at the same time, most of these same organizations will admit to spending very little time thinking through the layout and design of their online donation pages. 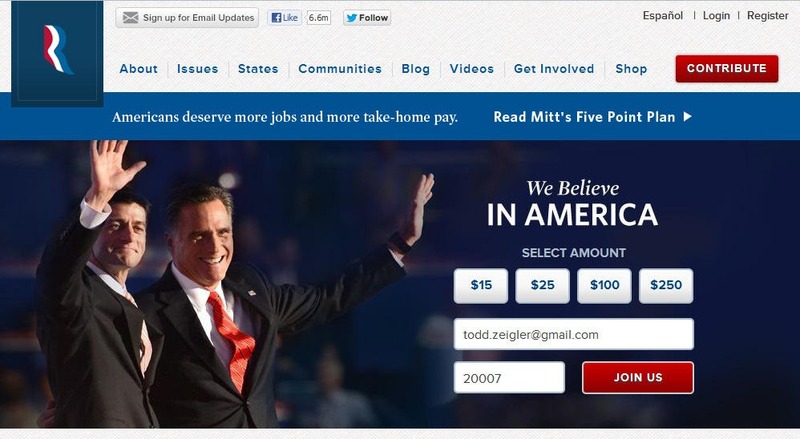 Despite being one of the most important pages on any website, the design of the donation page is usually treated as an afterthought. There are many reasons for this. 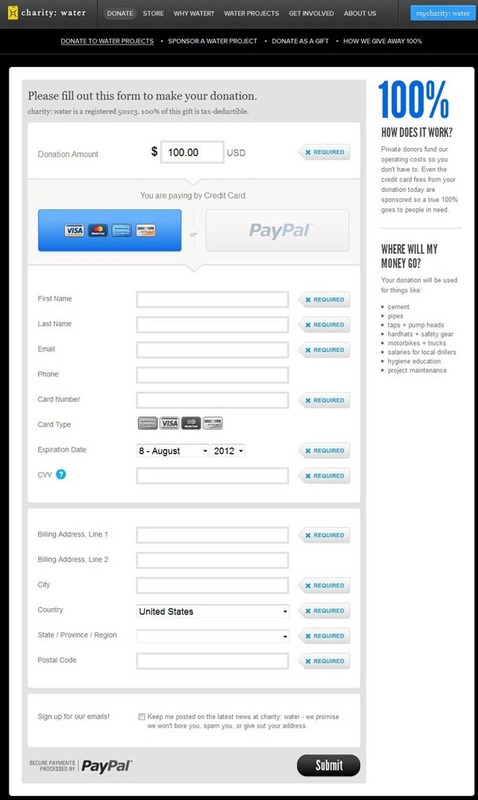 Many groups use pre-built forms provided by third-party donations platforms, so opportunities for customization are limited. Organizations that do have the resources to develop custom designs often exhaust their energy on sexier design challenges such as the homepage. The donation form is treated as something that can be sort of thrown in at the end as opposed to something that needs to be planned and designed. 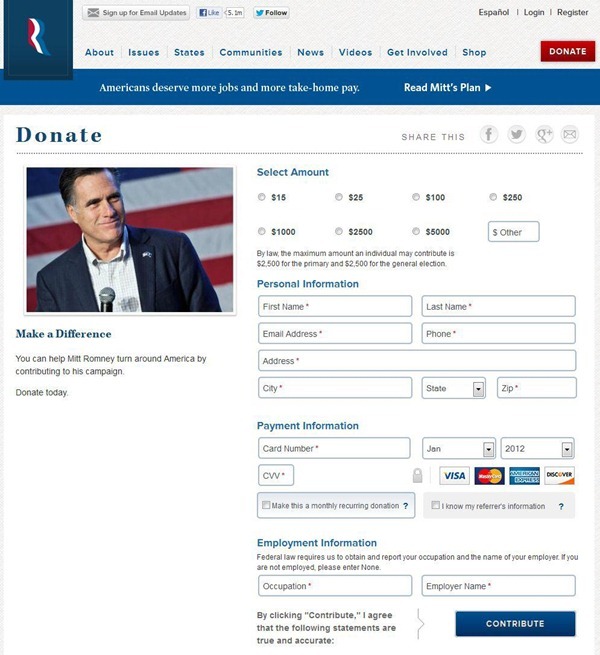 As a result you see lots of huge organizations with boring, utilitarian donation pages like this and this and this. I think this is an opportunity missed. A compelling, easy-to-use donation page can dramatically increase your conversion rate, and this can have a big impact on your bottom line. Just do the match. Say you are raising $10,000 a month online, with 20% of the people who visit your donation page making a donation. If you can up your conversion rate to 30% and the average donation stays the same, you’ll raise $15,000 a month instead of $10,000. It can add up. In an effort to provide some inspiration, following are five well designed donation pages that I would guess enjoy very good conversion rates. 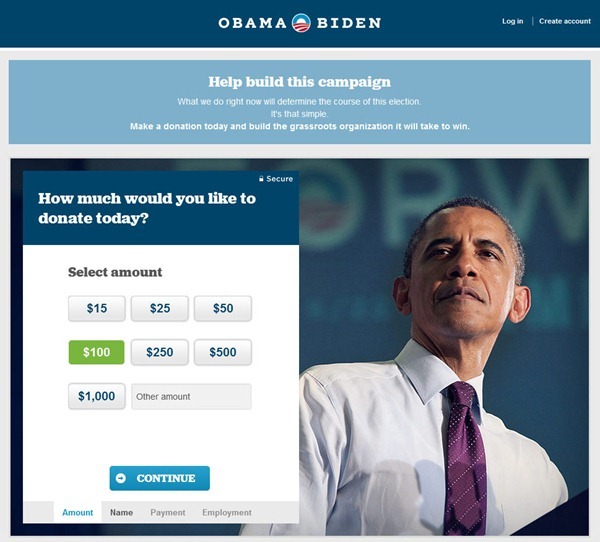 Given the stakes, it is no surprise that the Obama campaign has spent a lot of time optimizing its donation page. The current version of the page includes terrific photography that aims to creates a personal connection with the user. 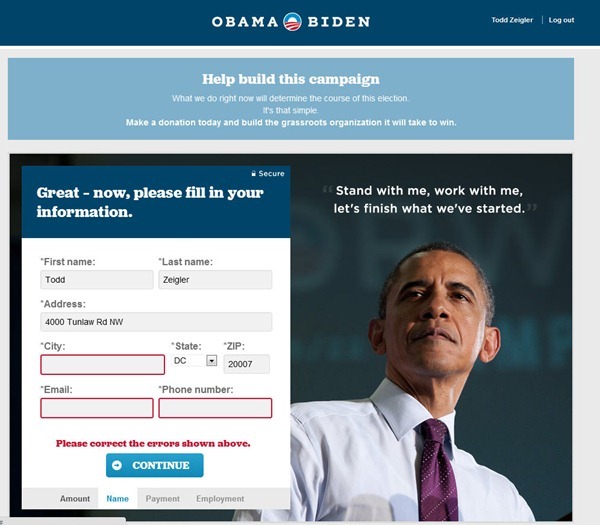 President Obama is essentially watching you fill out the form here. I also really like the way they have broken the form into multiple steps with pleasing transitions between the steps. The page also has great explanatory text and clear error messages that help you through. The form is as smooth as a desktop app. 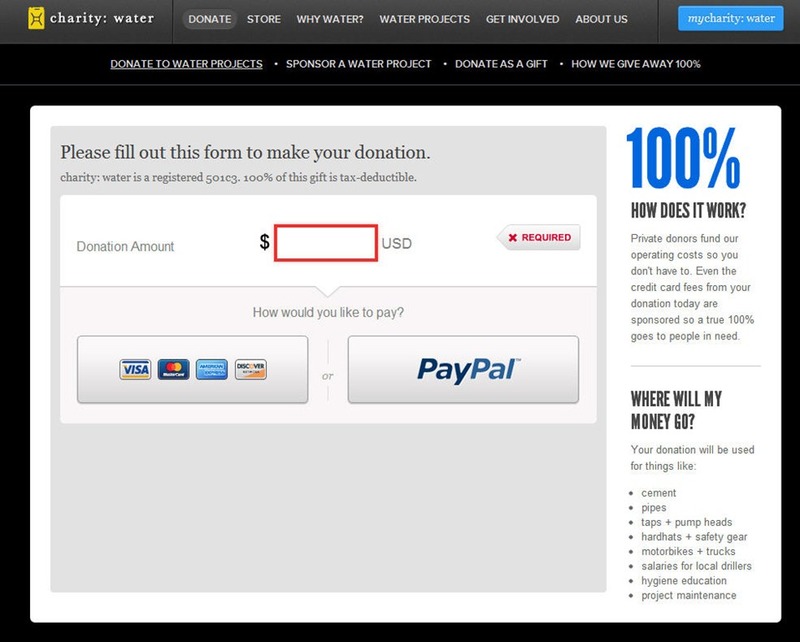 Just about everything charity: water does online is exceptional, so I would expect them to have a great donation page. I like how they break the form into two steps, the use of easy-to-read fonts and the clear explanation about where the money goes. This page features a great system for selecting the donation amount and allows for some white space and scrolling, making it really easy to fill out. 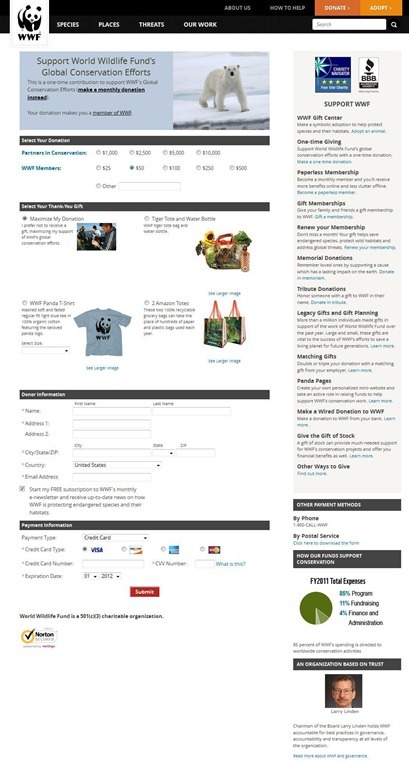 Too many donation forms cram as much information as possible into too small a space, hurting usability. 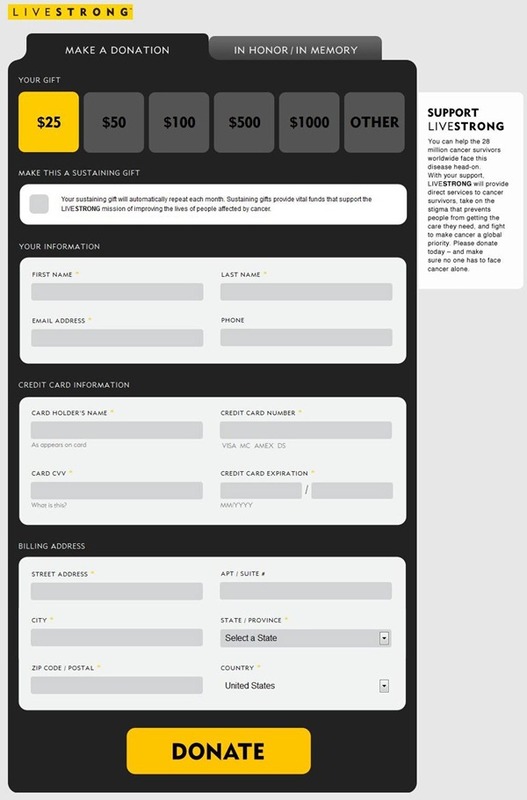 As with the charity: water example, LiveStrong also provides a clear explanation of where the money goes. The Romney campaign keeps things simple here. The donation form on www.mittromney.com is a well executed example of a traditional one page donation form. Big fonts. Easy to read. Idiot proof. I also really like how the campaign let’s users begin to fill out the form right on the site homepage. On this donation page as you select different donation amounts different thank you gift options appear below. This is a very smart way to get people to increase their donation. I don’t think the form itself is as easy to get through as it could be, but I really like the gift concept here. Have any other examples to share?